The Zephyr by Pierre-Paul Prudhon, Part 18 of the Introduction to Art and Artists of Our Time. 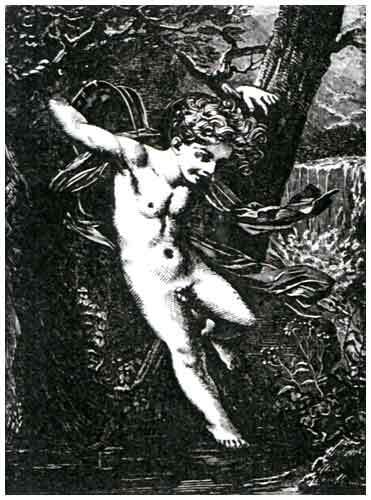 From the painting by Pierre-Paul Prudhon. "The Zephyr." The former of these pictures has long been one of the most popular in the gallery of the Louvre, where, on Sundays particularly, it enjoys the honor of a perpetual circle of admiring soldiers, peasants and ouvriers, who stare at this poetic translation of the daily police-reports with bovine satisfaction, while the superior world passes by with sniffs of pitying disdain. And in truth the picture, famous and popular as it is, does injustice to the delicate and graceful talent of Prudhon, which is seen to much more purpose in the lovely little figure of Zephyrus balancing himself so lightly over the cool stream. Prudhon excelled in subjects that permitted him to introduce amorini and ideal female figures, suggesting always the classical type, but which he treated in a way as far as possible removed from the archaeological or literary methods of his contemporaries. In truth, in spite of his subjects, he belongs far more to the Romantics than he does to the Classicists, and the interest taken in his works, slight as it is, is far more likely to be permanent than that felt for any other master of his time. The very story of his life and his connection with the luckless Mlle. Mayer - for which we have here no room - allies him to the romantic movement; it is a theme for a novel of Scott, or a poem by Byron, and might have moved a Goethe to another Sorrows of Werther.